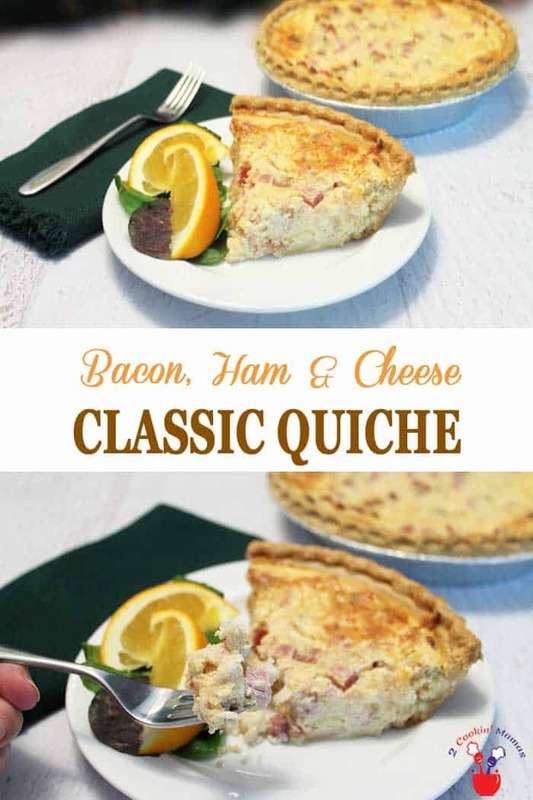 Whether it’s a special brunch, like Mother’s Day, or an every day dinner, this delicious Bacon Ham and Cheese Quiche is the perfect meal. 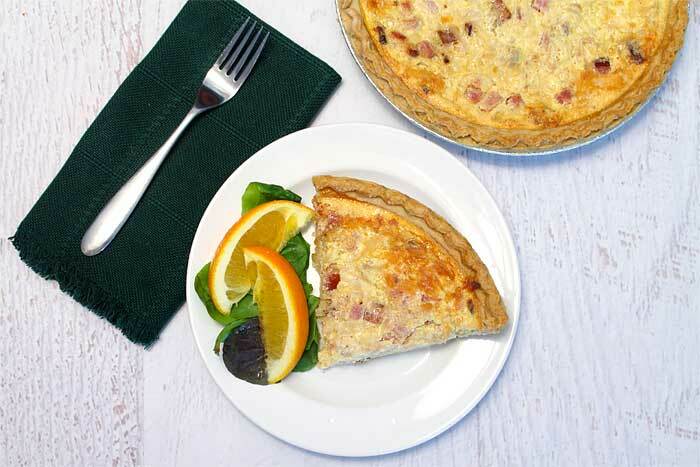 It brings all your favorite breakfast ingredients together in one creamy pie. 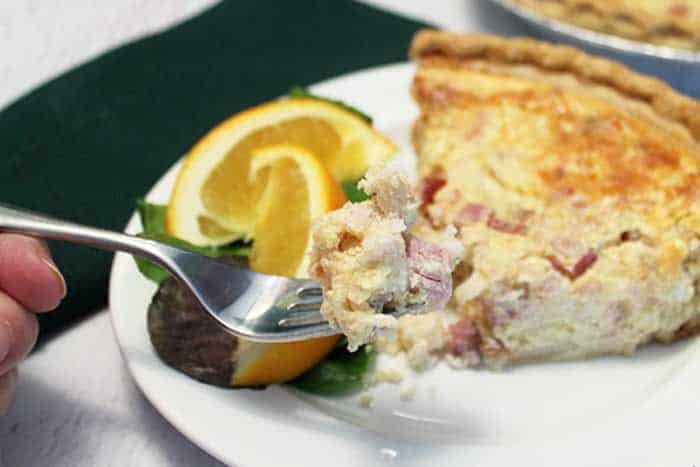 Crisp bacon, chunks of ham and creamy Swiss, set in a flaky crust, make for one flavorful treat. Mother’s Day is around the corner and one of our traditions has always been making her a spectacular brunch. After all, she is the person who loves us unconditionally, nutures us and believes in us and always spoils us. She actually deserves more than just a day! 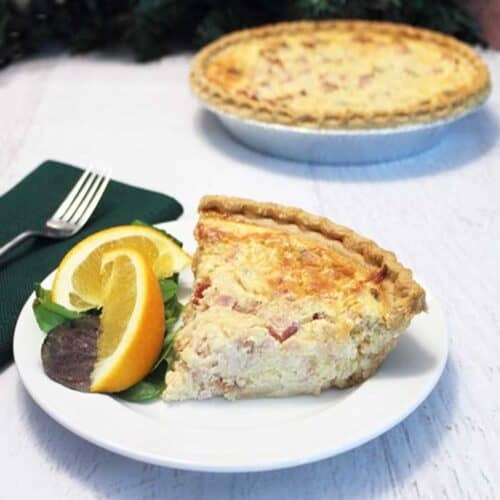 I don’t know about you but I like to make quiches or egg type casseroles for brunches like my Vegetable and Prosciutto Quiche and my One Skillet Ham Potato Bake. 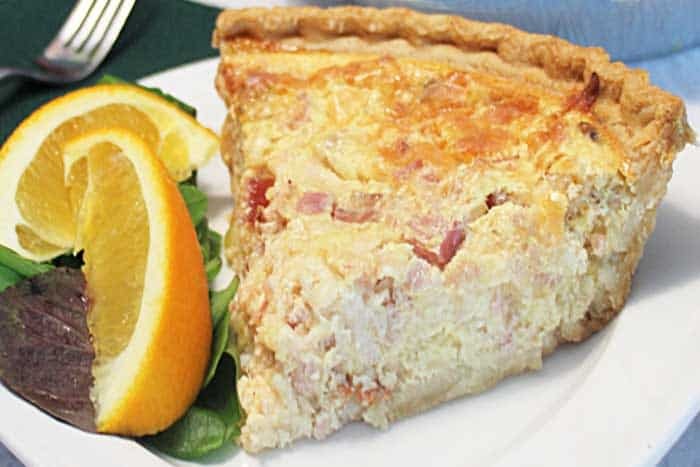 But, when I want something really special, I make this deliciously creamy Bacon Ham and Cheese Quiche. The recipe was given to me by my mother-in-law and has been a a favorite in our family for years. Usually I decide to make this recipe when I have leftover ham from the holidays in the refrigerator but sometimes, like for Mother’s Day, I actually go purchase a large ham steak and use that. It has a few steps but the time and effort are so worth it. To save time I use 2 pre-made deep dish pie crusts but I’ve also made it as one really big a** pie and just added about 15 minutes to the cooking time. The only real cooking to be done prior to baking is frying up the bacon and sauteing the onions. The rest is just a matter of shredding the cheese and chopping the ham. Then mix everything together, milk, eggs , some nutmeg and a pinch of cayenne, pour it into the pie crusts and bake. 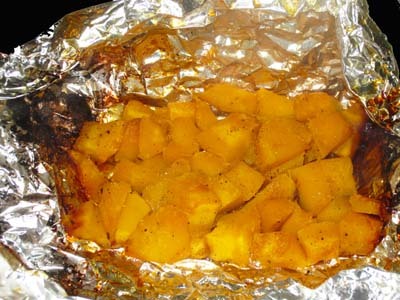 Once baked, it’s a good idea to let it rest for 10-15 minutes in order to make it easier to serve. Just look at that bite just packed full of chunks of ham and bits of bacon all in a creamy cheesy egg base. 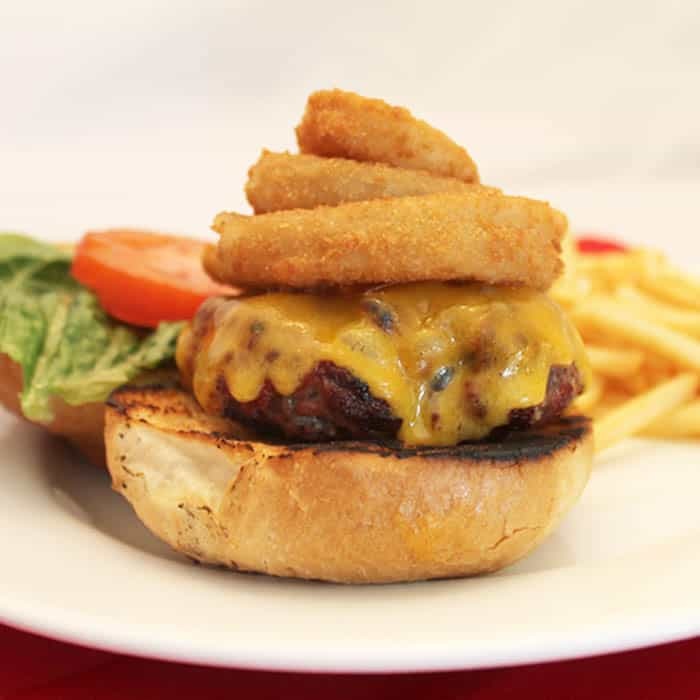 Doesn’t that make you want to make it for breakfast tomorrow? Oh, it’s soooo good! This makes 2 quiches so I always serve one and freeze one for later. They make great last minute dinners when you haven’t had time to plan anything. Gee, I wonder how I know that? 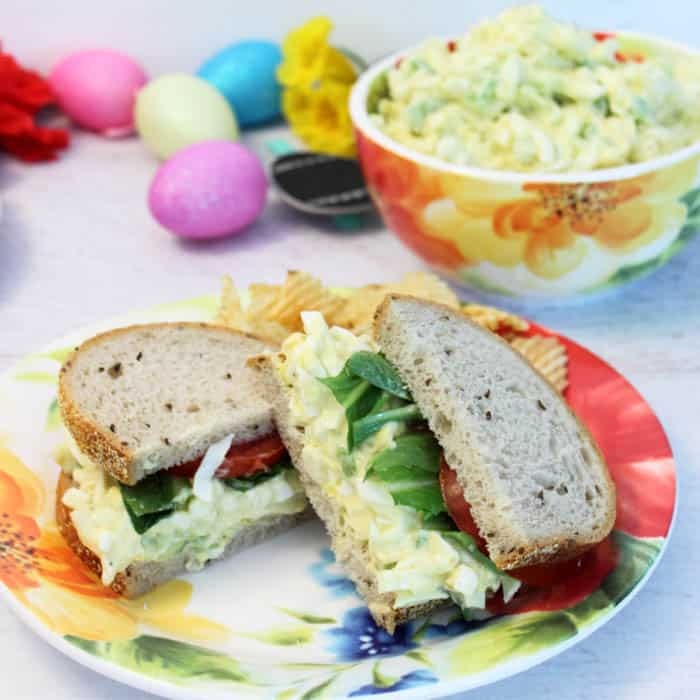 I serve mine with french bread and a side of fruit but you might want to add some pretty flowers for mom on her day ’cause she deserves only the best. This is so rich and creamy. Perfect for Mother’s Day and I love the idea of having another in the freezer! That’s one of my favorite parts too! Making a delicious one to eat immediately and having one in the freezer for those weeknights when I just don’t feel like cooking. My mom had a recipe for Ham quiche that I have been craving but she could not find the recipe. This replicated her dish perfectly. I’m so glad to hear it! Mom’s recipes are always the best! Enjoy! It is yummy! And I love to have the extra one for a day that I am really busy. Just pop in the oven and serve with a nice salad. Hope your week is great as well! Thanks for stopping by.